My latest sewing project is finished! Well, nearly. 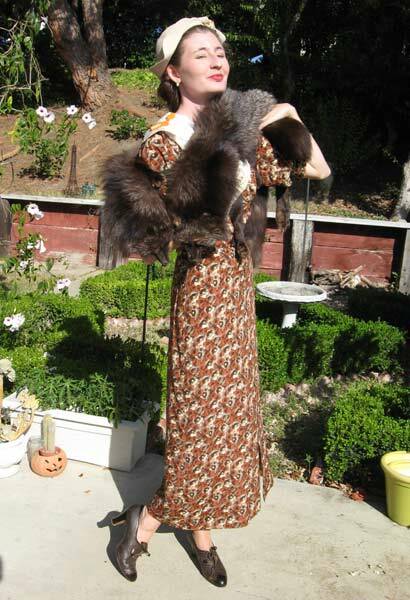 While I was putting up some of my vintage on my Etsy store I noticed a certain need for more dressy 30s frocks. 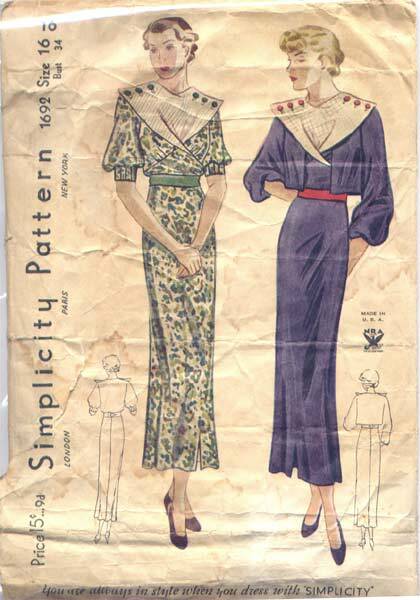 I sew so much sportswear, separates, and casual cotton dresses that I noticed I really need to make more dressy 30s frocks! The fabric I used for this project I bought years ago at the Vintage Fashion Expo in Santa Monica. I loved the colors but it was so busy that I couldn’t decide on a project. When looking through my patterns I found this NRA era one (Simplicity 1692) and thought instantly that the big white color would provide enough of a focal point to detract from the busy print and not make any of the fun style lines get lost! I only wish I had enough fabric to make a matching bolero. I feel very “middle class tries to be upper class”, and when I got all dressed up I purposefully put on more accessories than I needed and told my husband that I was doing my best “Stella Dallas” lol! 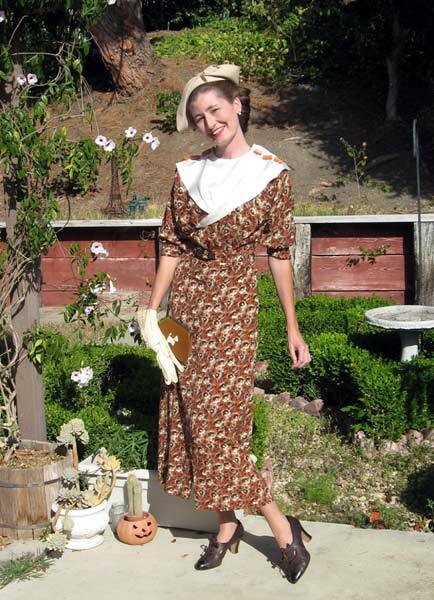 But I really do love it, and since the fabric is vintage it really does feel just like wearing an original dress. I’m going to be extra careful when I wear this one, though! >i recently stopped putting stuff on ebay and started an etsy store…i'm doing much better on etsy, but it doesn't have the immediacy of ebay, that's for sure. >Oh, Lauren, this is HEAVENLY!!!!! I am absolutely in love with every little bit of this ensemble!! Fantastic! >It looks so good *on*! I think it will look even better with the new buttons (they'll match the belt), but hot dawg this is cute. I love those gloves, too! >I love the dress and think it doesn't look busy at all, the collar does the trick. Maybe a nice little brown bolero would work? >That looks so good on you. 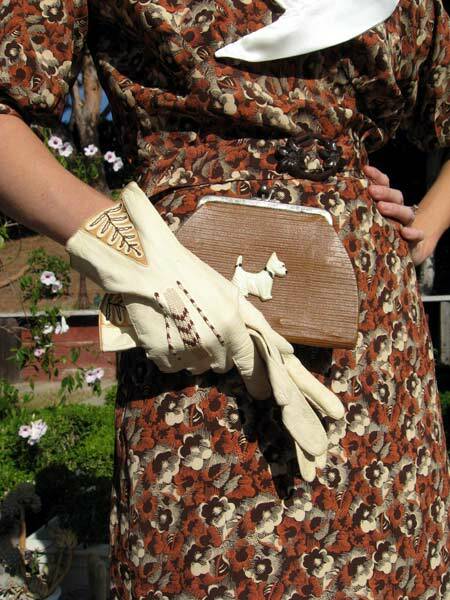 And that cutte little purse stole my heart. >I LOVE this dress! If you decide to repro this, I'd be interested. >I just love this look! It really suits you, too. >Wow! thanks so much all for your comments on the dress and accessories, too :)It was fun to finally get to use my vintage fabric, and I think this dress is telling me to wear it to the Queen Mary sometime ;)Thanks! >love the dress,and that shoes…amazing!